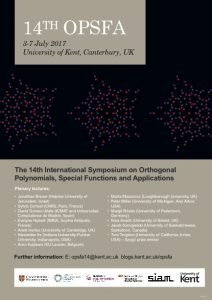 The 14th International Symposium on Orthogonal Polynomials, Special Functions and Applications (OPSFA14), organised by the School of Mathematics, Statistics and Actuarial Science at the University of Kent, Canterbury, UK, will take place 3rd-7th July 2017, with arrival day 2nd July 2017. 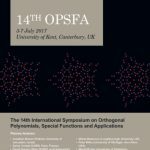 The conference is the 14th event in the OPSFA series and the first one to take place in the UK. 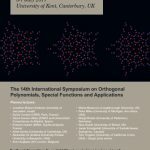 This symposium is an event of the SIAM Activity Group on Orthogonal Polynomials and Special Functions. The activity group promotes basic research in orthogonal polynomials and special functions; furthers the application of this subject in other parts of mathematics, and in science and industry; and encourages and supports the exchange of information, ideas, and techniques between workers in this field and other mathematicians and scientists. 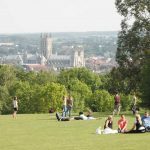 The activity group also awards the Gábor Szegö Prize every two years to an early-career researcher for outstanding research contributions in the area of orthogonal polynomials and special functions.